Restore silky and strong hair with the Orange Blossom 100% Natural Hydrating Shampoo. Enriched with hair nourishing and scalp relaxing oils of Argan, Kukui, Brazil Nut, and Shea. Made with coconut milk, an ingredient abundant with natural antiseptic fatty acids, and calendula extract to gently calm sensitive scalp. With a unique aroma of a sensual blend of essential oils this shampoo will work to renew and heal damaged and dehydrated hair. 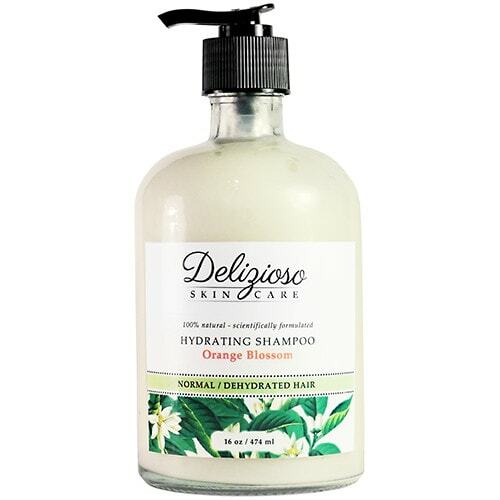 Restore silky and strong hair with the Orange Blossom 100% Natural Hydrating Shampoo. Enriched with hair nourishing and scalp relaxing oils of Argan, Kukui, Brazil Nut, and Shea. Made with coconut milk, an ingredient abundant with natural antiseptic fatty acids, and calendula extract to gently calm sensitive scalp.With a unique aroma of a sensual blend of essential oils this shampoo will work to renew and heal damaged and dehydrated hair. Mineral oil, SLS/SLES, fragrances, carmine, silicones, parabens, phthalates, phenoxyethanol, alchohols and other synthetic ingredients. *Aloe (Aloe) Barbadensis Leaf Juice, *Rose (Centifolia) Hydrosol, Foodgrade Xanthan Gum, Saponified Cocos nucifera (Coconut) Oil, Vegetable Glycerin, *Cocos nucifera (Coconut) Milk, Argania spinosa (Argan) Oil, Aleurites moluccana (Kukui) Nut Oil, *Bertholletia excelsa (Brazil) Nut Oil, *Butyrospermum parkii (Shea) Seed Oil, *Helianthus annuus (Sunflower) Oil, Mauritia flexuosa (Buriti) Fruit Oil, *Rosmarinus (Rosemary) Officinalis Leaf Extract, *Grapefruit (Citrus Grandis) Extract, *Calendula officinalis (Flower) Extract, Cucumis Sativus (Cucumber) Extract, *Citrus limonium (Lemon) Extract, *Citrus Aurantium Dulcis (Orange) Extract, *Saccharum Officinarum (Sugar Cane) Extract, Acer Saccharinum (Sugar Maple) Extract,, *Vaccinium myrtillus (Bilberry) Exract, Tocopherol (Rice derived non GMO Vitamin E), Jojoba Proteins, Citrus aurantium (Neroli) Essential Oil, Santalum album (Sandalwood) Essential Oil, Artemisia pallens (Davana) Essential Oil, *Clementine Essential Oil and Natural Antioxidant Preservative (from berries, tea tree, and extracts). Mica, Iron Oxides, Titanium Dioxide, Zinc Oxide (mineral pigments). Oh, the scent of this shampoo is so zingy and fresh. It leaves my hair silky and bouncy.